1. "All One in Christ Jesus" -- I loved Jennifer Rouse's story "Precious in God's Sight" about discussing race with her daughters. 2. "Knowing the True Light" -- Paula J. Hampton's "To Tell the Truth" about her first grader's lie struck a chord with me as I too have struggled with holding my young children to a standard of honesty that others would rather laugh off. 3. "Blessed are the Peacemakers" -- this is the section where the Mennonite teaching of pacifism is illustrated. Regardless of your political views, there is still much food for thought here. 4. 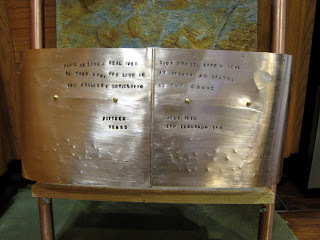 "Lilies of the Field" -- my favorite section as the battle against materialism is constant! "The Economics of Bouncy Balls" by Mock and "Buying the Whole Farm" by Marta Oti Sears both spoke to me in the daily struggle against the "I wants", but I also loved Jessica Kantola's "Choose to Be" on choosing happiness. 5. "In the World" -- "Starbucks-Colored Glasses" by Lisa Graham McMinn was an inspiring essay on treating the invisible people of our society with dignity and this whole section spoke to being in the world but not like the world, whatever the circumstance. I called this review "Encouragement from the Trenches of Parenthood" rather than "...Motherhood" because as other reviewers have said, this is a book to be read by all parents, not just moms. Definitely a worthy addition to any parent's library in spite of the title! 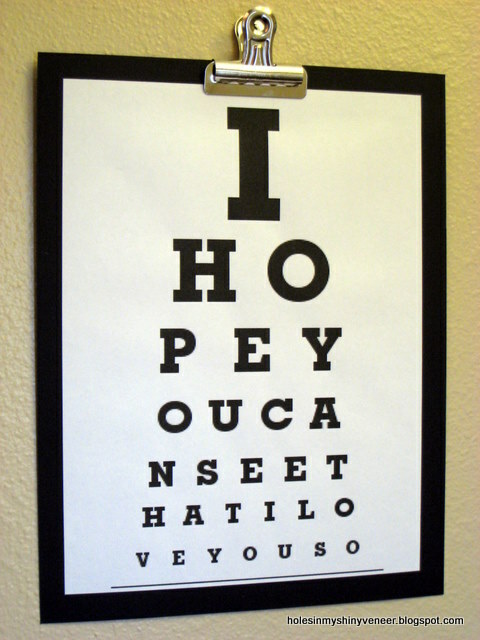 So I found this site that lets you customize an eye chart with your own letters, or in my case, sentence. 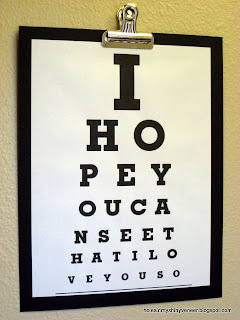 Sticking with the eye chart theme, I decided the perfect valentine for Other Half would be, "I hope you can see that I love you so." Once I typed in my words, I right-clicked to save the image as a JPG file. A little cardstock and a binder clip and I had the perfect valentine hung in our entry when he came home. Hard Lotion: You Gotta Try This! Sometime last summer in my bloggy reading, I came across an enthusiastic recommendation for MadeOn Hard Lotion Bars. I had never heard of hard lotion before, but I was intrigued by the all-natural ingredients and the enthusiastic testimonials. In checking out the site, I was amazed to see that the owner, Renee Harris, even posted a video to teach you how to make your own lotion bars. She believes so strongly in her product that she's willing to teach you how to make it yourself for free! With the winter weather, I've been telling so many friends about hard lotion as this has been the one thing that works for our family for both winter chapped lips and dry itchy skin. My friend Brenda was frustrated with her baby's itchy, rashy skin, so I packed up my crafting crockpot and 3 ingredients and headed over to her house to make a batch. That weekend, she let me know that her baby's skin was 90% better already! Brenda and I made enough lotion that day that we decided to make samples for our MOPS group. 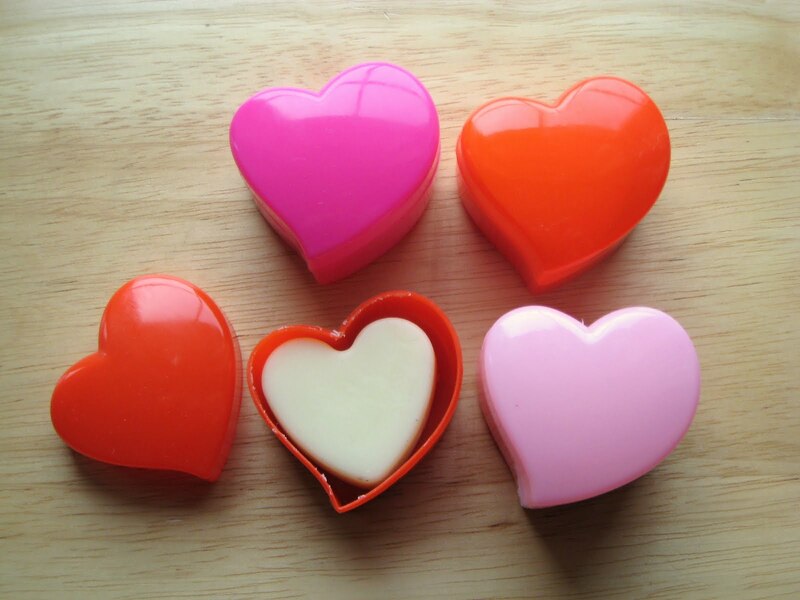 I found this Wilton silicone mold at JoAnn's last month and knew it would be perfect for trial-size lotion bars: At first I packaged them in little baggies, but then I found these little plastic Valentine treat boxes at the Dollar Store and was so thrilled that the lotion bars fit: This hard lotion has become the only lotion our family uses and I can't recommend it highly enough. 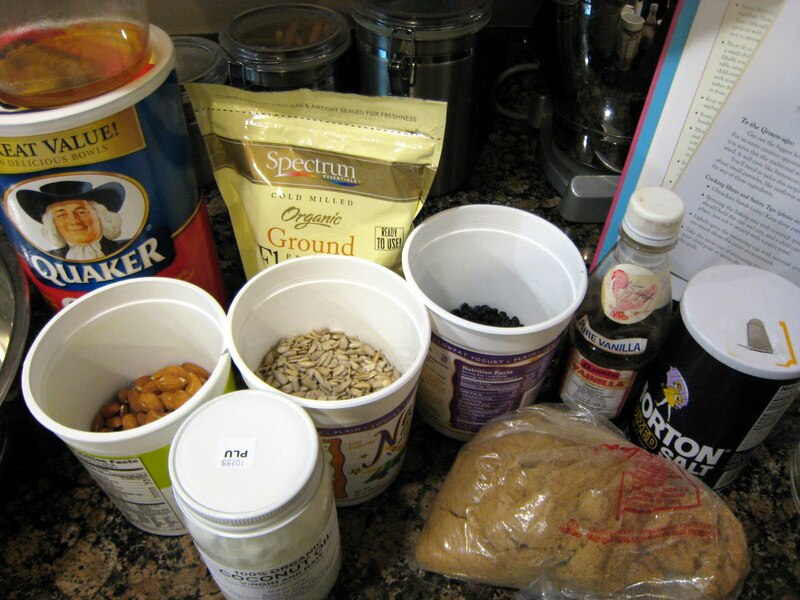 Renee has even put up a DIY kit for sale this week in case you'd like to get all your ingredients in one easy package. And no, she's not paying me for this post either -- we just love our hard lotion that much! 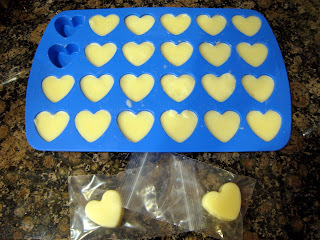 Update 3/28/11: Today Stephanie over at Keeper of the Home reviewed the DIY hard lotion kit. She gives a handy tutorial on making the lotion bars and lip balms and even calculates your savings! If you have any favorite uses for frozen berries I left out, I'd love to hear them in the comments! My posts mentioning Other Half lately have been about him rescuing me in the kitchen or teaching me to use power tools, but he's actually a man of many talents. To celebrate him this Father's Day, I thought I'd introduce you to Other Half, the Artist. We celebrated our 15th wedding anniversary this month, and this year, I was truly surprised by his gift. 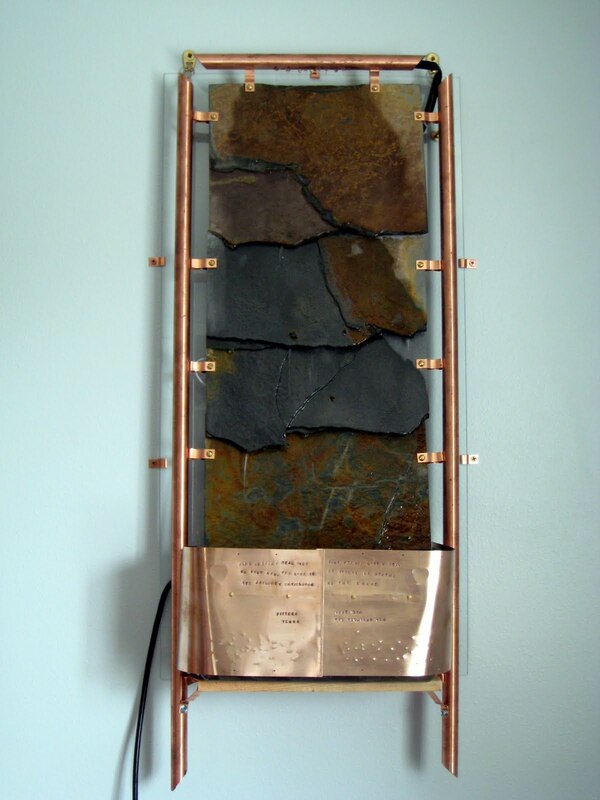 He decided to make me a water feature for our room -- before its installation I was falling asleep to fake waterfall sounds every night. He designed and crafted every inch of this fountain and I was left speechless when he presented it to me. 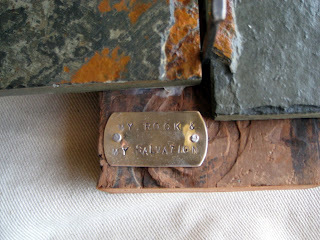 Here's a close-up of the base where he stamped our wedding verse, Song of Solomon 8:6. Pretty good for his first stamping project, don't you think? We also had a dear friend graduate from high school this month, so Other Half decided to make him a piece of artwork he could take with him to college. 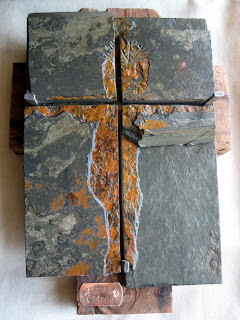 This was not a piece of slate that he cut a cross shape through down the middle, but rather, Other Half saw how he could make a Christ figure out of various slate pieces and put them together like a jigsaw puzzle. With the nails and the distressed wood, it makes a cross like no other. And here's a close-up of the silver dog tag where he stamped My Rock & My Salvation. Again, I think it's spectacular, and not just because I've been his wife for 15 years! 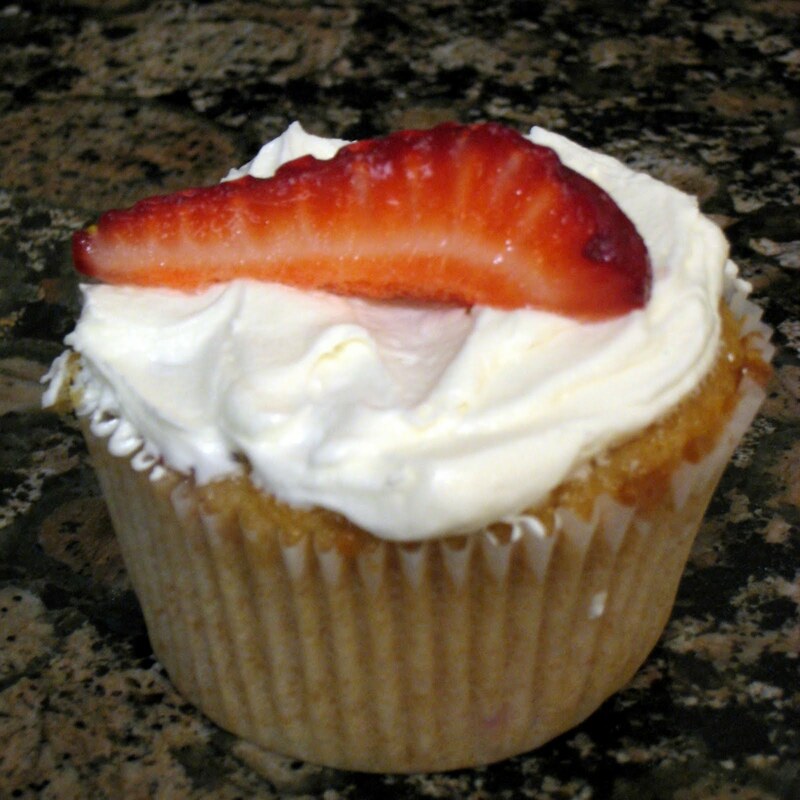 Strawberry season is finally in full swing in western Oregon, and so as the kiddos and I picked 10 pounds this morning, I thought it was time I share our new favorite recipe for fresh strawberry cupcakes. We just discovered these at Easter when Trader Joe's had some particularly good strawberries in, and they were so good that Mugger requested them for his birthday this week. So the recipe is found here at Just Jenn Recipes -- you'll have to click through for the link. We (and by "we" I mean Other Half as he is the Chief Cupcake Baker in this house) pretty much follow the recipe as it's written until the frosting part. 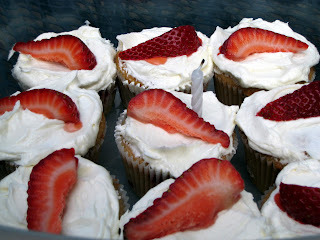 We haven't tried her suggestion for chocolate frosting -- Other Half made strawberry frosting for Easter and white frosting with a strawberry garnish for Mugger's birthday. The best thing about this recipe is that the unfrosted cupcakes freeze well, so you can double or triple the batch if you need to use up lots of berries. 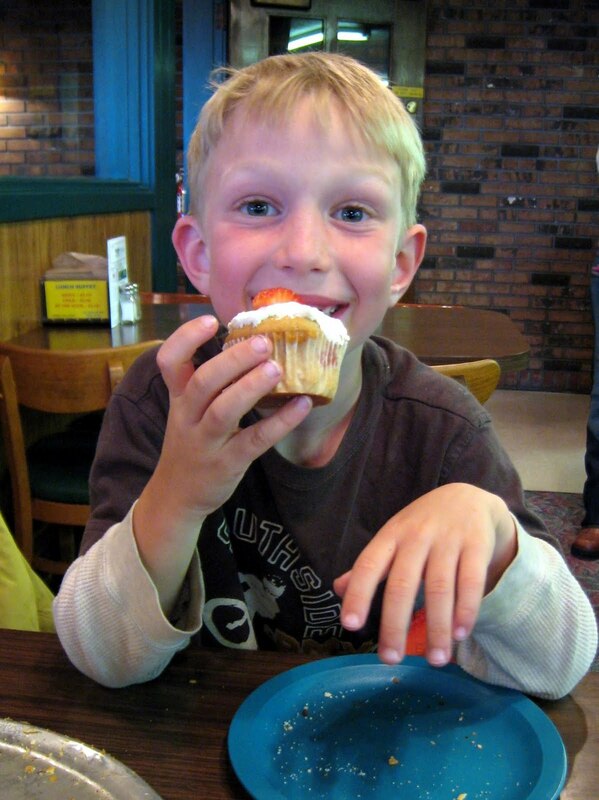 And if you leave the frosting off, you can call them muffins and serve them for breakfast, too! Can't wait to get my sliced strawberries this week -- this year we're getting 2 30-pound pails instead of just one! 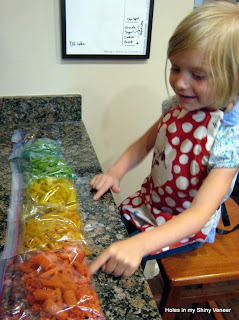 Since Bug wanted 6 different colors of pasta beads, we put our pasta into 6 different sealable sandwich baggies. 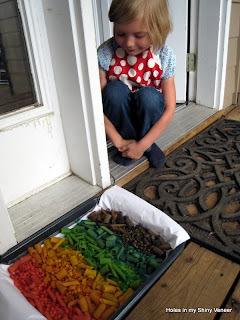 Each baggie then got 4 drops of food coloring (orange = 1 drop of red + 3 drops of yellow and purple = 3 drops of red + 1 or 2 drops of blue) and 1 tablespoon of rubbing alcohol. We zipped the baggies shut and then tumbled them gently to coat all the pasta pieces. 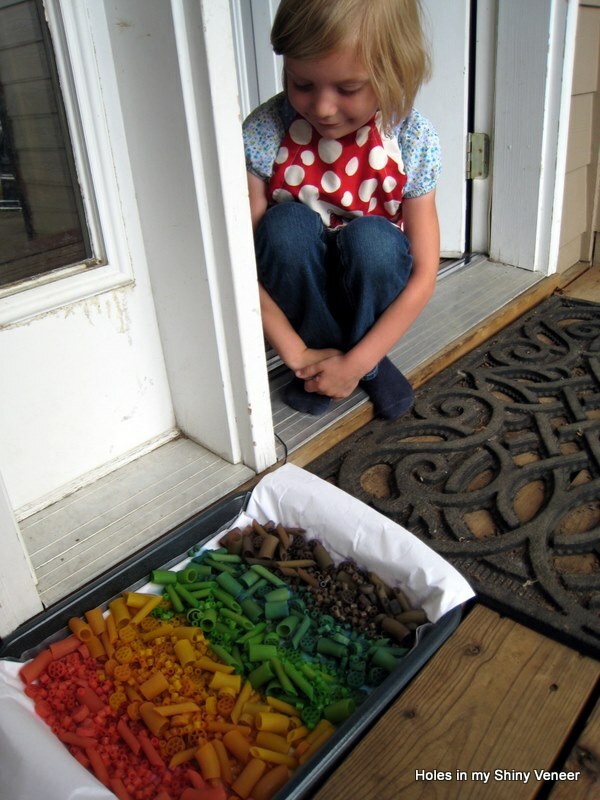 Bug spread out her baggies and gave them a quality control check to make sure they were all saturated with color. 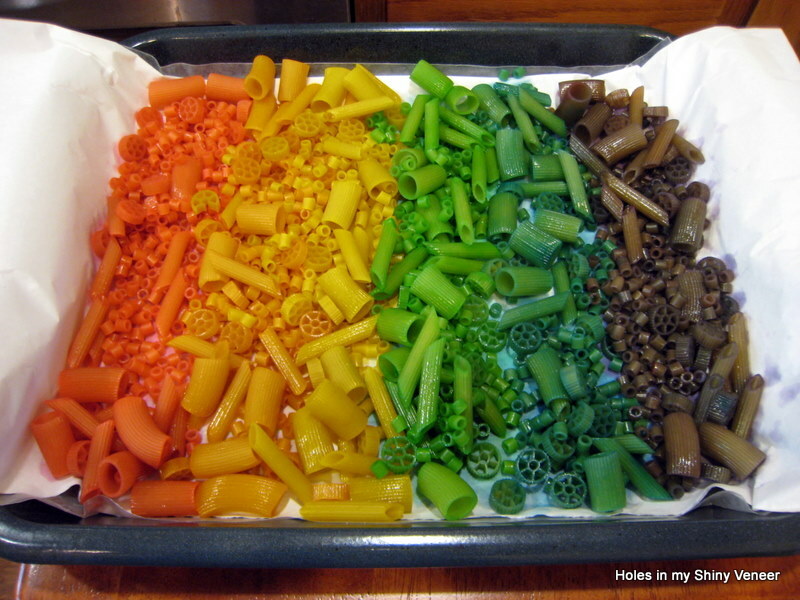 Then we spread them out on a pan to dry. Instead of letting the pasta dry on paper towels, I put tissue paper underneath, remembering a post on tie-dyed tissue paper from Parent Hacks. Bug's brother turns 7 tomorrow and she's hoping it will all be dry in time for wrapping his present. Make and Takes puts it out in the sun to dry faster, but unfortunately our Oregon skies are a bit rainy again today. Bug is thinking hopeful thoughts at least. We don't have it spread out real thin, so it might not be dry by tomorrow, but we'll post a creation when she gets to craft with her new beads. 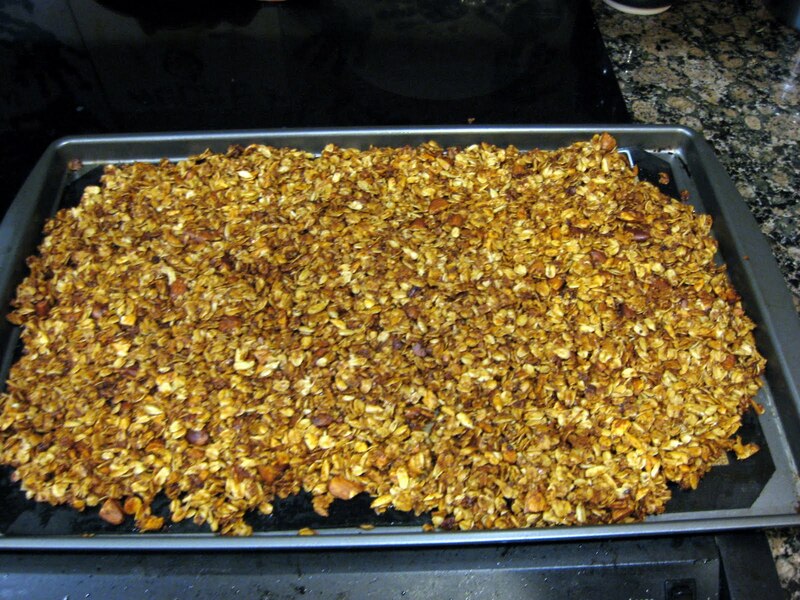 Coconut Oil Granola: The Best Ever! Sometimes I have the best of intentions, but then... well, you know how it goes. Such was the case with my purchase of Salad People by Mollie Katzen nearly 3 years ago -- I wanted to be that mom who cooked with her preschoolers so that they'd develop an enthusiasm for cooking and healthy eating at a young age. Well, the kiddos finish 1st grade and Pre-K this week, and here I am opening up Salad People with her for the first time. 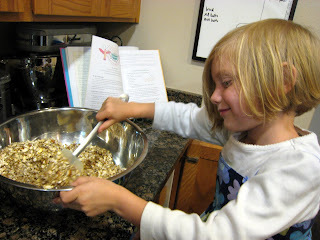 This awesome book would probably still be sitting on the shelf if not for the urging of my friend, Anna, who told me we had to try the granola recipe. A month later, we did, and wow! 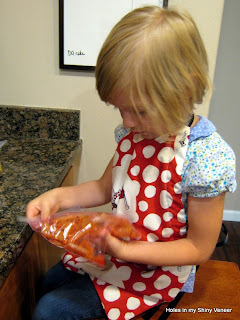 We didn't stray too far from the recipe, being that I'm a Kitchen Catastrophe and all. I did skip the nonstick spray for the baking tray since I have one of those nifty silicone baking mats (which I highly recommend as it cuts way down on greasing pans!) For the 2 cups combined seeds and nuts I used about a cup of almonds, 3/4 cup of sunflower seeds, and 1/4 cup ground flaxseeds -- I'm all about cramming that healthy stuff in there when I can. I did have one ingredient switch that I think made a huge difference in the flavor: instead of canola oil, I used coconut oil. The smell and flavor was phenomenal! I know coconut oil doesn't work everywhere, but it sure works in this recipe. I think next time I might even try to cut down on the oil a bit, too. ...as well as smashing it flat into the pan for baking. 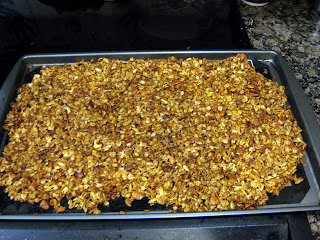 And after 30 minutes: crunchy golden goodness! Broken up, this filled 2 quart jars which I've been keeping in the freezer for maximum freshness. One jar is already gone as Other Half has pronounced this to be 10 times better than anything store-bought. I had dried currants to add to it after baking, but we've loved it plain. 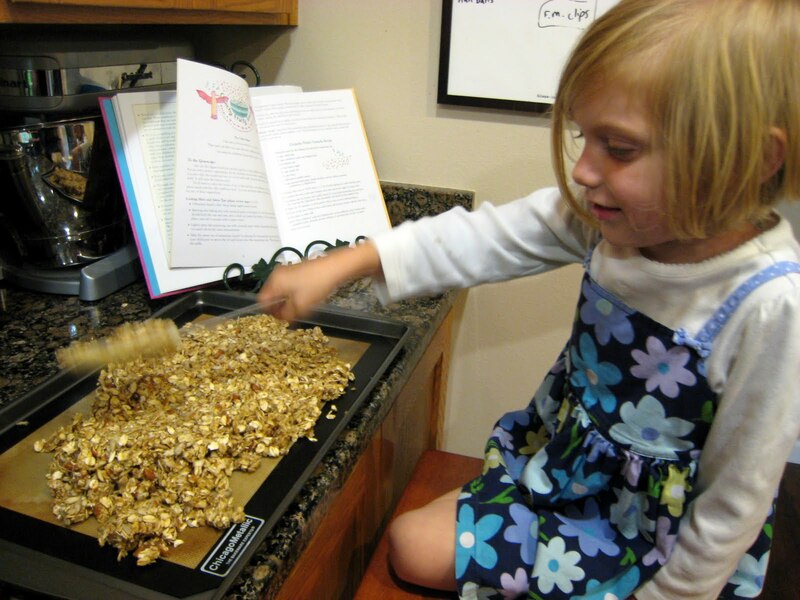 If anyone else has used coconut oil in granola or has a link to a favorite recipe, I'd love to hear about it in the comments! Preheat oven to 325 degrees. Grease and flour a 10-inch Bundt pan. Stir together the cake mix, instant pudding and sugar. Add the water, oil, eggs, and yogurt, mix until well blended. Finally, fold in the chocolate chips. Pour into the prepared Bundt pan. Bake for 50 to 60 minutes in the preheated oven. Cake is done when a toothpick inserted comes out clean. Cool in pan for 10 minutes before inverting onto a wire rack to cool completely. So we actually ended up making this cake twice. Why? Apparently because I, being the Kitchen Catastrophe that I am, cannot grease and flour a pan properly. Other Half cautioned me about over-flouring the pan and I think I totally under-floured it in my fear. 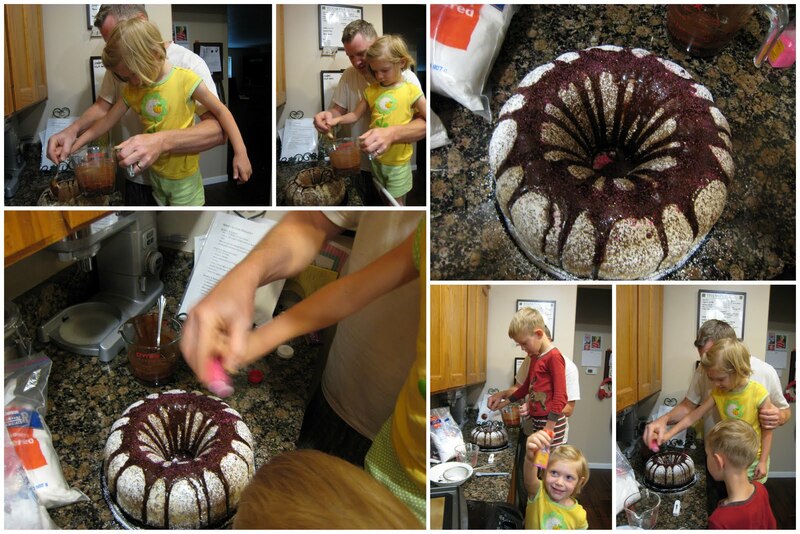 Happily for them, my kiddos had to consume Cake #1 as it came out of the pan as a crumbled mess. So, while I was teaching my adult Spanish class, the rest of the family mixed up Cake #2, shown in the pictures above-- if you look closely, you can see all the excess flour on the cake as Other Half didn't want to risk repeating my error in the 11th hour. 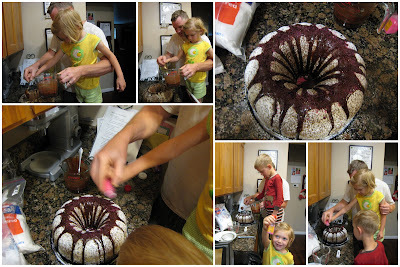 Since the cake came out of the oven after the kiddos were in bed, they got to decorate it in their jammies before school the next morning. This cake certainly doesn't need anything as it is moist and yummy and very chocolaty all by itself, but Bug had her heart set on sprinkles. So, first Other Half whipped up a basic chocolate glaze, and Bug drizzled on Layer #1. Then it got a good dusting of powdered sugar to cover up the flour, chocolate glaze Layer #2 (with help from Mugger who wanted in on the decorating action), and finally some pink sprinkles. Bug decided that the pink sprinkles would be a little clue that the chocolate chips were raspberry chocolate chips, making her cake extra special. And special it was -- she won the award for Most Unique in the Pre-K class. As for the cake itself, it was yummy and yes, I'd make it again. I'm usually a from-scratch baker as I'm getting more conscious about what's in my food, but for a quick dessert to be made out of things I can keep in the pantry, this yellow cake mix and chocolate pudding mix combo can't be beat. Actually, a reviewer on AllRecipes gave several other variations she had tried and I think it won't be too long before I'm swapping in lemon pudding and blueberries. For collecting our plans, I found a great summer calendar template to print off here at Thirty Handmade Days as part of her Funner in the Summer series-- isn't it cute? Play in the Park Tuesdays: Our MOPS group meets at a different park every Tuesday morning in the summer, so I'm looking forward to checking out some new parks with the kiddos. After 2 years here, I still feel like the new kid on the block sometimes! 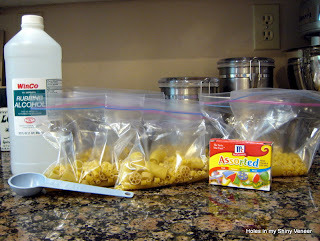 Wacky Wednesdays: This is our science experiment day for Mugger. He's receiving the Sciencewiz Chemistry Experiments and Book for his birthday and also has Gizmos & Gadgets and Things that Go Boom! to find projects in. 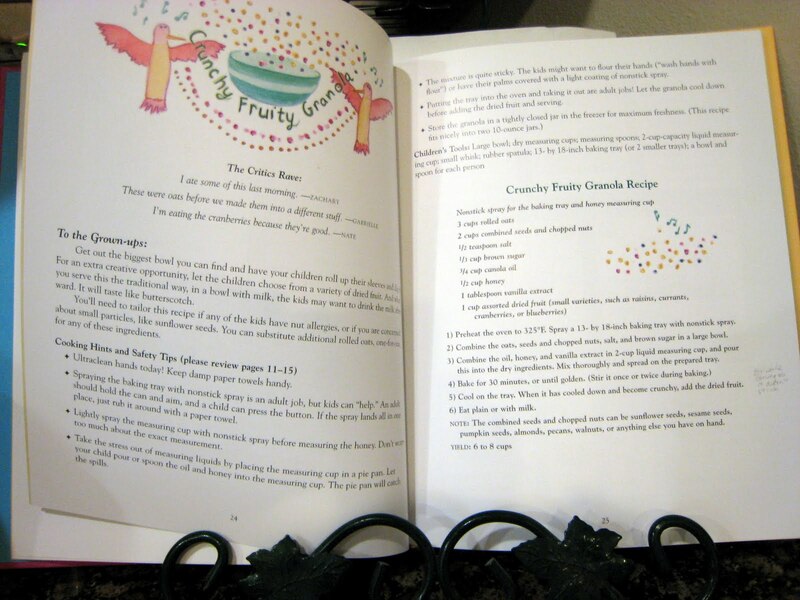 Those, along with some good concoctions and contraptions in the Kid Concoctions book, as well as some projects I've bookmarked, mean we'll have plenty to keep us busy on Wednesdays. Family Fun Fridays: Other Half's day off is Friday, so this will be our family field trip day. Some Fridays we'll be at the pool or camping, but we do have a couple of bigger field trips planned like the Salem children's museum, Enchanted Forest theme park, and OMSI. Can't wait! And not on the schedule but whenever we feel like it will be all our food activities: berry picking, making jam, gardening, making ice cream in baggies, cooking outside in the new fire pit, and baking new recipes. My mouth is watering already! So what about you? Any big plans? We're always game for more ideas if you have winners you'd like to share.